So many flavors. So creamy. So festive. So healthy. It’s everything. You can play with the spice ratio as you see fit. This comes out with a pretty legit kick of heat so be aware. The soup is creamy but not heavy, if you would like to substitute light coconut milk though go ahead. It started to get pretty chilly last week and this soup was an ideal week night dinner. Breaking down squash continues to be the worst thing about making any recipe that requires it but I assure you this soup is worth the exertion. Pairs well with wine, naan bread, and good conversation (thanks to Kelsey for the soup/stay in/chat game plan that made this soup possible). Chop off the top portion of the garlic head to reveal cloves. Peel any excess paper/skin off the bulb of garlic. Pour about one teaspoon of olive oil on top of the garlic cloves and cover with foil. Roast for 45 minutes, or until the garlic is golden brown and soft. Remove from the oven and allow to cool five minutes. Squeeze garlic out of the paper skin to use later. Meanwhile, add the coconut oil to a large soup pot set over medium heat. Once hot, add red pepper and cook for 3-5 minutes. Add squash, curry powder, smoked paprika, cumin, cinnamon, cayenne and thyme. Season with salt/pep. Cook for 3-5 minutes then pour in coconut milk and veggie broth. Bring the soup to boil, reduce the heat, cover and simmer for 20-25 minutes or until the butternut squash is fork tender. While the soup is cooking, make the ginger cream. Combine yogurt and ginger in small bowl. Thin out with milk to get a cream-like consistency. Cover and place in the fridge until ready to serve. Once the butternut squash is tender, add the roasted garlic and the crumbled goat cheese to the soup. Remove the pot from the stove and allow to cool slightly, then puree the (I used a hand blender). Return the soup back to the stove and heat through. To serve, ladle the soup into bowl. 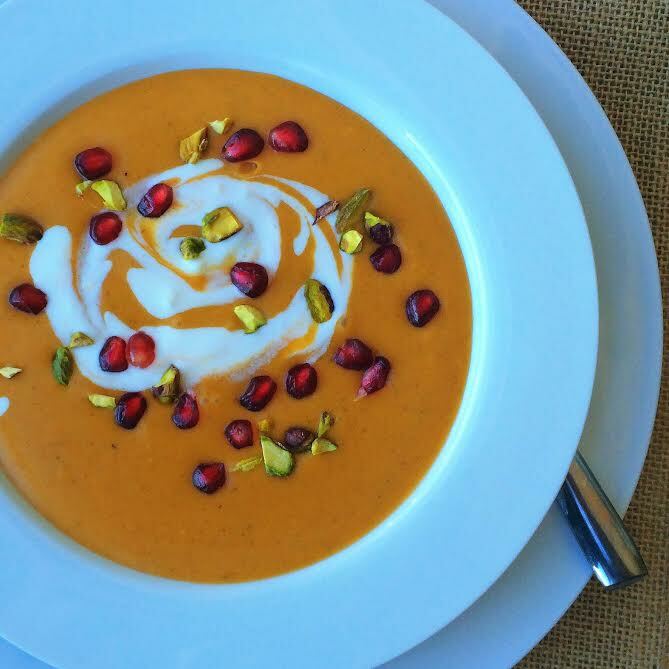 Drizzle the coconut ginger cream over the soup and swirl with a spoon. 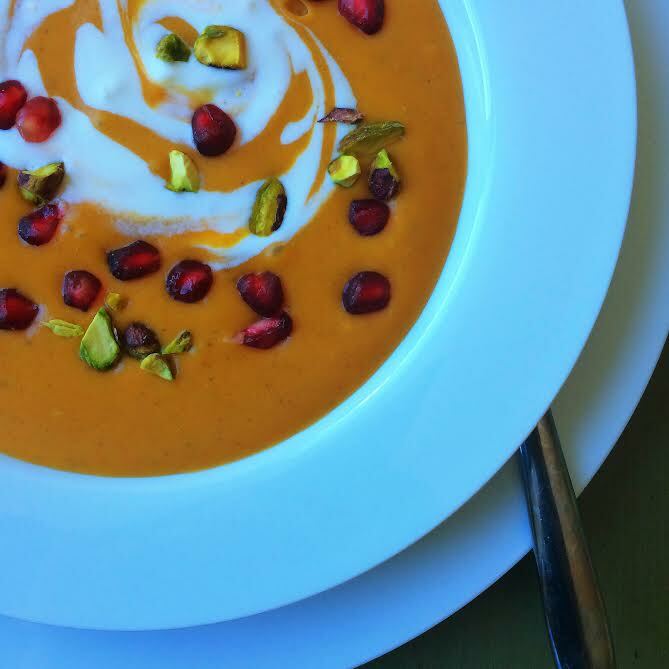 Garnish with chopped pistachios, pomegranate arils and whatever else you want to sprinkle on this beauty. Ooooo, I like this recipe a lot. 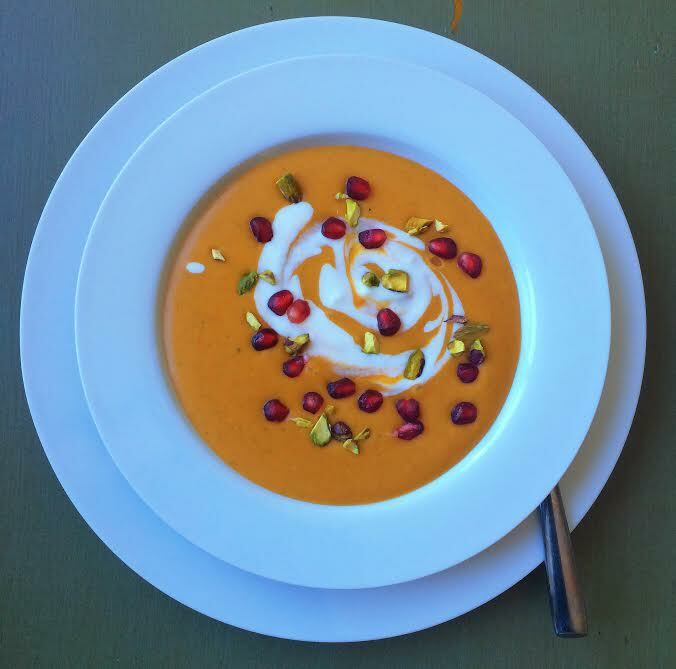 Love butternut squash soup and usually do a ginger & curry version, but your recipe looks so much more interesting. The additions of the pistachios and pomegranate is brilliant! I’m actually making butternut squash soup for tomorrow night’s dinner so I’ll have to try your recipe. Thanks for sharing 🙂 BTW, your photos on here and on IG are gorgeous.